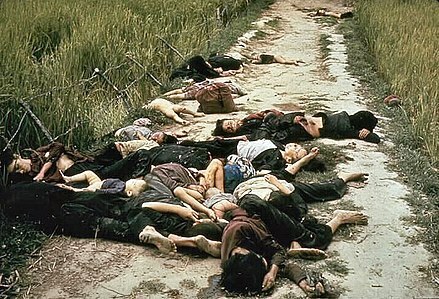 A photo of massacred villagers became an icon of the My Lai atrocity. —from Ron Ridenhour’s letter to U.S. government officials alerting them to the Vietnam War’s My Lai Massacre. Exactly 50 years have passed since the spring of 1969 when Ron Ridenhour, a U.S. soldier who had served as a helicopter gunner in Vietnam, mailed a 1,500-word letter to congressmen and Pentagon officials disclosing details of an atrocity that has come to be known as the My Lai Massacre. Hundreds of villagers died at My Lai — children, men, women — gunned down by American troops irked by the persistence of booby traps and land mines in the area. Ridenhour’s letter and follow-up investigative work led to criminal charges against 26 soldiers, of whom just one was convicted, a gung-ho first lieutenant named William Calley, Jr. — clearly a scapegoat, in Ridenhour’s view, for a war crime in which commanding officers and, indeed, the top echelons of the Defense Department should have been held to account. Two years after the massacre, Calley was sentenced to life in prison, but served only four years under house arrest at Ft. Benning, thanks to political pressure from, among others, President Nixon and Jimmy Carter, then the governor of Georgia, Calley’s home. Ridenhour, a California native who had grown up in Arizona, moved to New Orleans after the war and continued to work as an investigative reporter. Writing for City Business, he received the George Polk Award for Investigative Journalism, one of the profession’s top honors, for a year-long probe of a New Orleans tax scandal. He died suddenly in 1998 of an apparent heart attack while playing hand ball. Ridenhour was 52. …a crime against humanity more recent than My Lai: the Trump administration’s decision to separate thousands of immigrant children from their parents and stash these traumatized youngsters in cages. Since 2004, the Ridenhour Prizes have been awarded in his honor to men and women “who persevere in acts of truth-telling that protect the public interest, promote social justice or illuminate a more just vision of society.” The prizes, founded by author and philanthropist Randy Fertel and awarded by the Fertel Foundation and Type Media (formerly the Nation Institute), carry a $10,000 stipend. In introducing this year’s winners, Fertel spoke of our era as a time of “rampant deceit.” The “liar of all liars” occupies the White House, Fertel said, but he noted that in the Nixon era Ridenhour struck back against a willful disregard for the truth only more insidious for being slightly less blatant. Seven honorees were presented with Ridenhour Prizes this year, in the categories of book writing, documentary film, reportage and truth-telling, on topics ranging from gender and racial discrimination to a crime against humanity more recent than My Lai: the Trump administration’s decision to separate thousands of immigrant children from their parents and stash these traumatized youngsters in cages. For the list of prize winners, click here. This year’s Courage Prize, the most prestigious of the Ridenhour awards, went to the Hungarian-American investor and philanthropist George Soros. Soros’ lifelong fight for open and democratic governance and a more just society began in the years of Soviet rule in Eastern Europe and, ironically, has now made him and his Open Society Foundations a target of the neo-fascists cropping up in some of the same countries once held in thrall to Moscow. 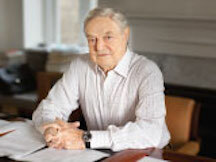 Soros’ work to advance fair and transparent governance in Europe, the U.S. and around the globe has led to his vilification by nationalists and populists on the right and the left. He has been excoriated by the Trump camp as well as by Viktor Orban, the authoritarian prime minister of Hungary, and is a favorite target of far-right conspiracy theorists who haunt the internet’s lunatic fringe. Soros, 88, has distributed some $32 billion to the Open Society Foundations, which funds groups, including The Lens, engaged in the fight for open government and against oppression, bigotry and injustice. Facing hostility from Orban, Soros recently moved the Open Society Foundations office in his native Budapest to Berlin. A pipe bomb was found earlier this year at his home outside New York City. … What is most gratifying to me today is your timing. You make this award at a time when the values of the Open Society are under attack around the world, including the United States. I want to thank the Committee for recognizing my life’s work. I, on my part, recognize this award as a wider tribute to the brave and committed people I have worked with over the years through the Open Society Foundations. These are the people who have the courage to speak out. For accountability. For justice. For human dignity. Today many of them are facing a concerted effort to silence them, and to demonize them. Those in power brand them as “enemies of the people.” They concoct conspiracy theories to discredit their good work. All because they stand up for human rights, particularly for the rights of the most vulnerable. Some of our grantees, like Márta Pardavi of the Hungarian Helsinki Committee, have to live with this kind of vilification and orchestrated hostility every day, because of their work to protect the legal rights of migrants and refugees. In Turkey, President Erdogan has arrested and kept in solitary confinement since October 2017 my close friend Osman Kavala, [a businessman and philanthropist] who has been the main supporter of our foundation in Turkey. The government has recently indicted him and 15 other people associated with our foundation on charges holding them responsible for the peaceful protests in Gezi Park in 2013. I fear that the prosecution will ask for life sentences. And I could cite other countries. They follow the advice of Frederick Douglass who said, “Power concedes nothing without a demand.” They provide that demand. The Front Line Defenders group reported that in 2018 a total of 321 human rights activists were murdered. Twenty-three of them were killed in Brazil. They included Marielle Franco – a friend of the Open Society Foundations. Marielle was raised in the favelas of Rio and she became an activist and local politician who spoke out for the city’s poor black communities. She was 38 when she was shot to death in March last year, together with her driver. That was before the election of [Brazil’s] President [Jair] Bolsonaro, who joins today’s gallery of would-be dictators. He is a great admirer and imitator of President Trump. Yet the people we work with keep speaking out. They face violence and intimidation because they keep challenging the entrenched structures of political power. They follow the advice of Frederick Douglass who said, “Power concedes nothing without a demand.” They provide that demand. I have been fortunate to be able to support such people. It is of great importance for my foundations, which seek to address the various problems confronting humanity, that they should continue to raise their voice in spite of the mortal danger they face. As a final note, I want to tell you that I’ll donate the prize money associated with this award to the Hungarian Spectrum, an online English-language publication that provides daily updates on Hungarian politics. It renders an important service by exposing to the world what Prime Minister Orban is telling his own people. It deserves to be better known and supported. So, to close, I thank you for this honor, which I accept on behalf of all those people who continue to fight for the open society.